Sutherland Shire entertainer, James Bustar, is leading the crusade as Australia’s funniest juggler. 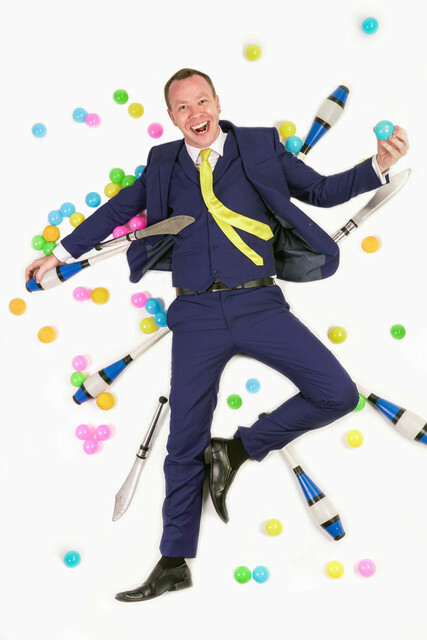 Bustar began juggling at age 11, and was juggling almost 24 hours a day; he now takes his comedic and skilful routine to arenas and corporate events all over the country. According to neuroscientists and physiologists, completing regular juggling exercises can improve both physical and mental health. In an Oxford University study published in Nature Neuroscience, participants who practiced a daily juggling routine were shown to gain a 5% increase in cerebral 'white matter' as seen on an MRI. That reinforced the findings of previous studies, which showed similar boosts in grey matter. The areas of the brain impacted by juggling include those dedicated to spatial calculation and awareness — in other words, the better you are at juggling, the better you will be at hand-eye coordination. In turn, hand-eye coordination has flow-on effects to social communication skills, reading, writing, and mathematics, according to research from Indiana University and the University of Leeds. In an era of tablet computers and virtual reality goggles, a juggling kit seems decidedly low-tech. Bustar believes that juggling should be encouraged in young people, and should even be taught at school.